The main fear was the at-large system would favour the wealthy, celebrities and political blocs who could afford citywide campaigns. It is understood the Government is considering a halfway house with six urban wards, each with three councillors elected within the ward at large. There would also be two rural wards for Franklin and Rodney with one councillor each. Most councils - and submitters to the Auckland governance select committee - favoured councillors being elected to represent a single ward. 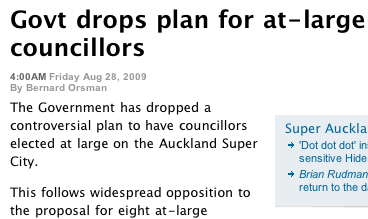 Auckland City Council was the only council to support at-large councillors. My submissions argued in favour of at-large seats too, but not 8. Crucially - to avoid the spectre of the personally wealthy being the only ones in real competition at that level - it is necessary that the number be at least 9 - preferably 11 (similar to London's Authority) on a list/ticket basis. Conducting an at-large election of 8 on a First-past-the-post basis would be biased in favour of celebrity candidates and the mega-rich. With a ticket/list system (like the MMP list system) council positions become possible for third parties and the chances are a wider group of people will be elected than if it was done FPP style (where it will be personalities rather than a political contest of policies). "Political blocs" are actually the right way to express political preferences and for that to be derided in the report is bizarre. But to abandon the idea of the entire Auckland electorate as a whole being able to elect councillors is a retrograde step. If the point in amalgamating all the councils of Auckland together is to get coherence and unitary plans and policies then it does follow that having councillors elected by the whole region will do this. These councillors, collectively, will have a unique mandate that the parochial local ward councillors will not have. These city-wide councillors will have to earn votes everywhere, represent everyone and most importantly of all have to think and act for the whole of Auckland. If they remove this element of at-large representation then it will actually be easier for the wealthy to exploit and make a gerrymandered two-party system an inevitability. The reason both the Nats and Labour will support single member electorates is so they can control the system and exclude rivals, while minimising their expenses. Most people don't seem to understand the game that they are playing here when they call for a ward-only system. Any FPP system limits diversity of elected members and entrenches the two ruling parties - that's the way it works and that is why Labour will support the Nats if they go down this path. They want to lock up the city politically for the next 50-100 years. The most effective way to achieve this hegemony is single member wards, the second most effective is two member wards - both options are being touted by the major players according to the article. So effectively we have FPP on a regional level. Greaaaaaaaaaaaat. Effectively most votes are now pointless as certain wards will vote for a certain candidate based on teh social economic group of that area. Fail to see the advantage other than making that member supposidly 'route' for that area.